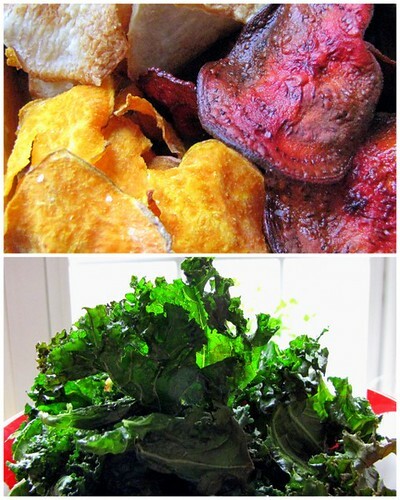 Baked Root and Leaf Vegetable Crisps ~ I Can Do That! One of the leafy green vegetables I love is kale. It's so good simply sauteed in extra virgin olive oil, garlic, onion, and sea salt, and is an excellent addition to soups. My favorite preparation of kale is baking them until crispy. The kale crisps are nutty and have an appealing slight bitterness. Absolutely delicious and addicting. Baked root vegetable crisps such as sweet potatoes, beets, taro, and parsnips are also very good for snacking. To make root vegetable crisps: Sweet potatoes, parsnips, and beets: scrub well, leave unpeeled; peel taro. Slice thinly using a mandoline slicer or by hand. In separate bowls, drizzle each root with olive oil, lightly toss, and sprinkle with sea salt. Place a single layer on baking sheets and bake in a 350°F oven for 10 minutes. Flip the pieces and bake for another 10 minutes or until the edges are curly and browned. The beets will take longer to bake, about 10 minute more. To make kale crisps: Remove the leaves from the stem and tear into bite size pieces. Wash and spin dry thoroughly. Drizzle olive oil, lightly massaging it on the leaf surface. Sprinkle with sea salt and place a single layer on baking sheets. Bake in a 325°F oven for 10 minutes. Flip the leaves and bake for another 6 to 10 minutes. yummy healthy snacks! haven't tasted kale, though. from your description, i think i'm going to love it! wow! healthy and yummy! I haven't tried baking them...only fried...ala-chips but this is certainly a better alternative...hubby will like these. Love the kale crisp idea! Will for sure give that one a try. Ps it is good to know another Ashburn VA girl! !